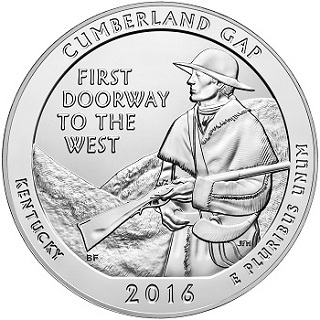 The U.S. Mint opened sales of the Cumberland Gap 5 oz. silver bullion coins to its authorized purchasers on Monday and sold an impressive 48,000 units right out of the gate. Four days later, the total is up to 64,000 coins sold, putting the Cumberland Gap issue ahead of 2011’s Vicksburg design as having the fifth-highest mintage ever for an America the Beautiful 5 oz. silver bullion coin. Combined sales for the 2016 Shawnee and Cumberland Gap bullion issues have now reached 169,000 units, which is 79.7% of last year’s overall total of 212,000. And though it’s only April, 2016 has already seen the production of more ATB 5 oz. silver bullion coins than any year other the 2011 and 2015. As noted on Mint News Blog, the Cumberland Gap 5 oz. coins were awarded an overall mintage limit of 150,000 pieces across bullion and Uncirculated strikes. The Mint has put the mintage limit for the Uncirculated version of the Cumberland Gap 5 oz. coin at 30,000 pieces, meaning the bullion issue will be limited to 120,000 in order to keep the total within the 150,000-piece limit. If the Mint does decide to sell more than 120,000 bullion pieces, however, it reserves the right to transfer coins over from the Uncirculated allocation, as long as the total for both issues does not exceed 150,000. The Mint sells its bullion issues to a network of authorized buyers, who then make the coins available to the public. With silver climbing in value this week to $17.19 per ounce, it’s unlikely demand for the commodity will soften any time soon.